The Bureau of Investigative Journalism quite rightly threw up its arms in protest this week at the accusation by an anonymous ‘senior American counterterrorism official’ that they were ‘helping al-Qaeda’ by revealing the death toll of civilian casualties in CIA drone strikes in Pakistan, whilst also pointing out that this was not the first time US officials had attacked their findings. Although most would see the claim that the Bureau is aiding the terrorist network as merely a transparent tantrum by Washington, it’s rather easier for the same officials to make the ‘al-Qaeda sympathiser’ label stick on a Yemeni citizen. Shaye was the first journalist to claim the US was responsible for killing 55 people, including 21 children, along with 14 alleged al-Qaeda members, in an attack in the province of Abyan in December 2009. The thinly veiled charges saw Shaye sentenced in January last year to five years behind bars. Days later Ali Abdullah Saleh, as one of several concessions offered to appease anti-government protesters, granted him a presidential pardon. But Shaye never walked free. Due to direct intervention by President Barack Obama, in a phone call to his Yemeni counterpart on February 2, Shaye remained in jail. The reaction by the US this week to the Bureau’s findings serves well to underline the reason behind Shaye’s continued incarceration and Washington’s interference in his case. The Yemen Times has repeatedly covered Shaye’s plight, but otherwise his detention at the behest of the US president has gone largely unnoticed by the English speaking press. The Yemeni Journalist Syndicate has made several requests to visit Shaye in prison, but during more than a year and half in jail only his family have been granted access. The International Federation of Journalists announced this week it had written a letter to Hilary Clinton “to demand that the administration lift its objection to the release of Shaye.” As a paid up card-carrying [ironically the very card that got me into court to see Shaye’s trial] member of the IFJ I think it’s an embarrassment that it’s taken the organisation a year to respond. Perhaps some consolation for Shaye and his family is that his time in prison may well have saved his life. Given the events of last year and the increase in CIA drone strikes in southern Yemen since May 2011, if Shaye had been a free man and continued in his line of work it’s distinctly possible he would have become a victim of the very strikes he sought to expose; a “mistake” as Washington claimed the two teenagers killed in a Shabwa drone strike were in October last year, or a convenient coincidence. Chris Woods and colleagues at the Bureau are fortunate they remain out of reach of anything more than stroppy comments from anonymous senior US officials. 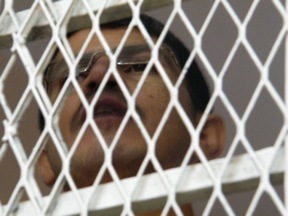 In Yemen the wrath of Washington leaves Shaye facing another four years in a Sana’a prison.